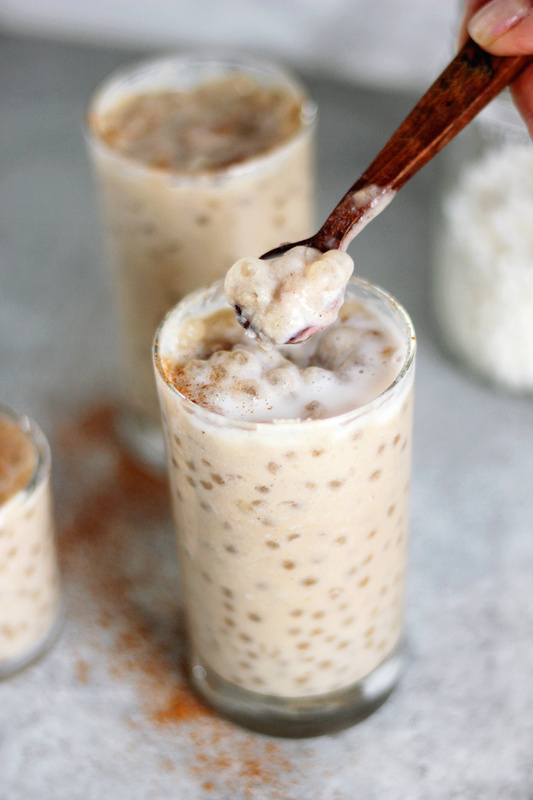 Oh well hello there you delicious Vegan Coconut Tapioca Pudding that’s SUGAR FREE! 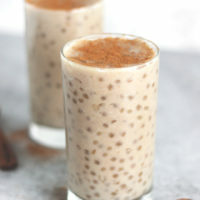 I Love tapioca, it was a favorite of mine growing up. I liked eating those little squishy bubbles. 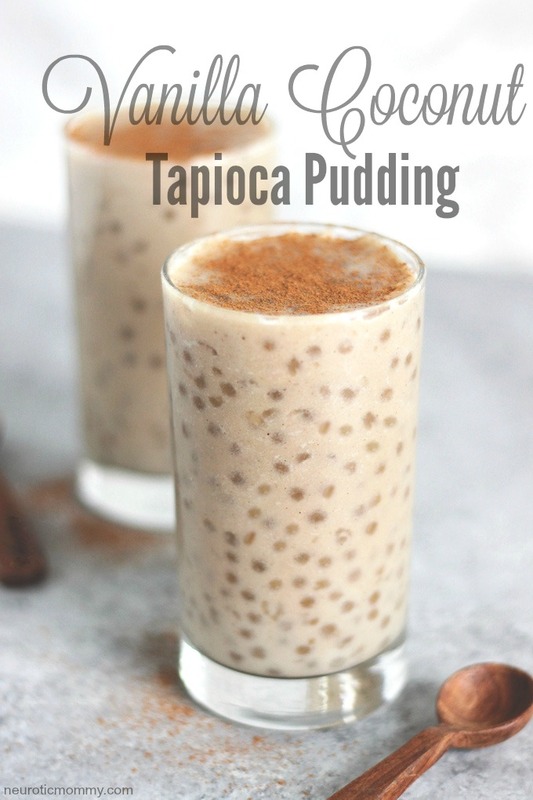 I always wondered what tapioca was and now in my age of 21 (lol just kidding), I know what those bubbly treats were in that pudding I loved so much. Tapioca is a starch extracted from the cassava root and it’s all carbs. It has no fiber or protein. A cassava root is a sweet, nut flavored tuber native to South America. It resembles the shape of a potato. 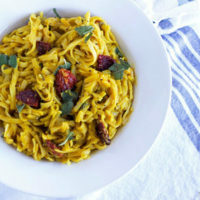 It’s naturally gluten free which is great for people who suffer from celiac’s disease. Tapioca is sold inexpensively as flour, flakes, or pearls (like I used for this pudding). 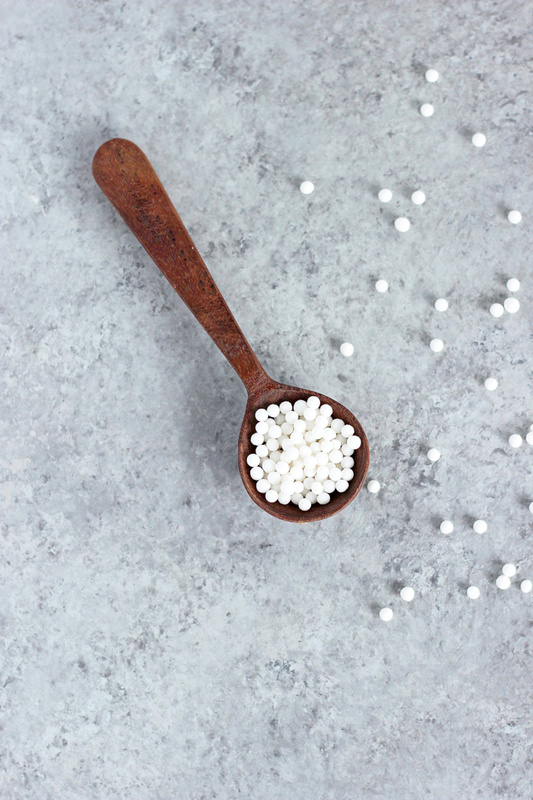 Tapioca is widely used in food. It can be used in bread recipes, desserts, as a thickener, or as a binding agent in dough to improve texture and moisture content. This prevents sogginess. 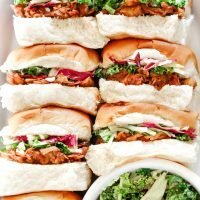 “GI is a classification of food based on the blood glucose response to a food relative to a standard glucose solution. Low glycemic foods control the release of glucose into the bloodstream at a steady and sustained rate, keeping the body’s metabolic processes and energy levels balanced. People with low glycemic diets or [who] eat low glycemic foods are said to have lower risk of getting coronary heart disease and type 2 diabetes. 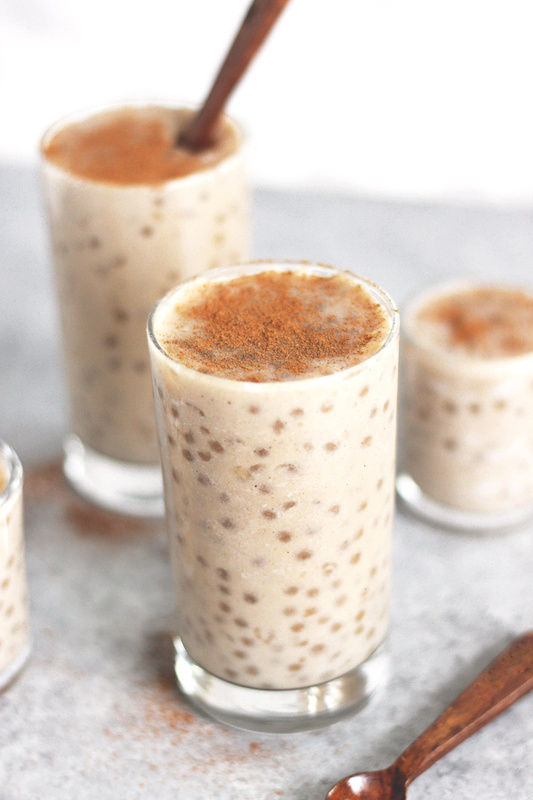 So why not get your tapioca on! I’ve used tapioca flour in some of my recipes but I haven’t dabbled my hand in the pudding because I guessed it was super complicated. But guess what…it’s not! Hooray! This pudding is thick, creamy, and just sweet enough using maple syrup. Prior to making the pudding the heavy labor is soaking the tapioca pearls in almond or coconut milk for an hour, (I know, so daunting). Once they’ve been soaked it’s time to start making your soon to be new favorite snack. In just under half hour I had a pudding back in my life I thought had been gone forever. It was a huge hit with my son and hubs so I had to make more. I decided to doubled batch it the second time around so we had lots and lots of pudding. Once I like something, that’s it, I can’t stop and won’t stop. One serving is approximately 88-94 calories (if you count), which is seriously not bad for a snack this decadent. Super deceitful I tell ya! Your new healthy, go-to easy snack that's low calorie, creamy, and delicious. 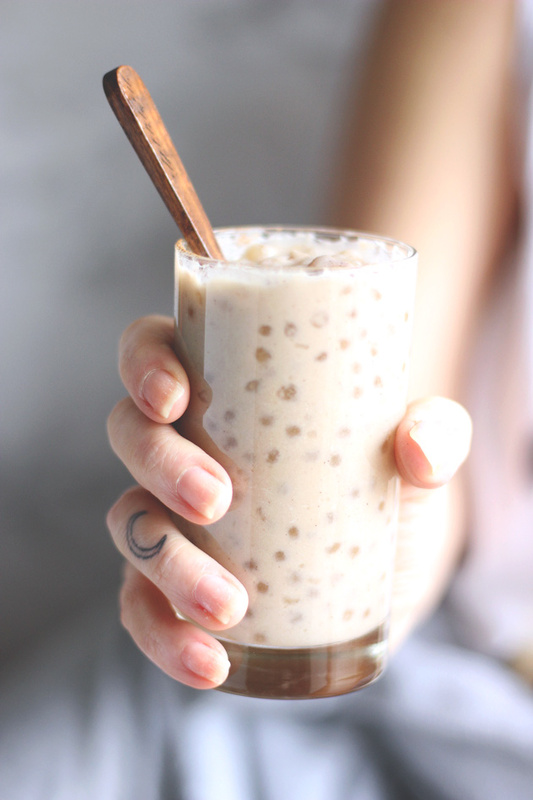 Soak tapioca pearls in 1 cup of dairy free milk for one hour. Drain tapioca and place all ingredients into a medium to large sauce pan. Over medium to high heat, bring mixture to a boil. Lower to a simmer and let cook for 25 minutes, until pearls are translucent, stirring frequently. If they are not translucent by 25 minutes, you can leave them in an extra 10. The tapioca will start to thicken up especially once it's cooling. Transfer to serving bowls, jars, or ramekins and place in the fridge and let set for 20 minutes, 1 hour, or even over night. Before serving top with your favorite fruit or cinnamon and Enjoy! Thanks for posting this. I’m excited to try. This is not sugar free,though…maple syrup is not processed but it is still sugar. Same with honey. Your body processes sugar the same way regardless of the label. 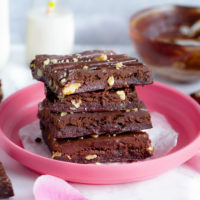 Trying out a simplified version based on this with 1 cup of large pearls, a half gallon of chocolate almond and cashew protein milk plus a can of full fat coconut cream. No need to add sugar. Might go add some vanilla now. I soaked for more than 1 hour in 1.5 cups of the chocolate dairy free milk and did not drain. I hope that was long enough for the large pearls. I also heated the milk to near boiling before putting it in the crock pot and I hope it is done before I want to go to bed. I do not want to leave it over night. I hate to burst your bubble but this isn’t sugar free. Maple syrup is sugar. Rebecca, maple syrup is a natural sweetener with nutritional health benefits … it is not processed, refined, white sugar which has adverse effects on your health. Using natural sweeteners in cooking and baking is always a better option than using something processed and unnatural. Ignore my last comment!! Just took the time to read ore carefully and saw it says it’s for soaking only. Sorry!! Do you add the non-dairy milk once you’re ready to cook? Or just to soak? Sorry…may be obvious but the recipe has all the ingredients I’m looking for and I’m too excited, so don’t want to mess it up. Thanks! Can you use reduced fat coconut cream rather than full fat ? Or will that affect the end result ? Hi Heidi, I’m not totally sure as I never used it with reduced fat coconut cream. If you give it a go and it works out let me know! When you drain the pearls after soaking are you throwing away the milk they soak in or do they absorb most of it? I’ve made it twice it’s delicious . First time soaked in coconut milk for one hour. Today didn’t have time so the pearls soaked for less than thirty mins in water. The texture is somewhat gritty, not nearly as good, I used s big mason jar for second bath first was put into my miltiple. Where do you think I went wrong? Is soaking in milk key?? So bummed. Hmmm, let me think. Did you wait until they were completely translucent? I haven’t had that happen to me and not sure if water would make them gritty or not. Hi, HOw did you get your calorie count? For almost every full fat canned coconut milk I’m looking at, the calories are 140-198 per serving, with 4-5 servings in a can. For 2 cans making 8 servings, each serving is at LEAST that, not including the other ingredients. I estimated the calories with my fitness pal. It also depends on the serving size of the cups you use, so 4-5 oz is between approximately 94-100 calories. Each serving does not have an entire can of coconut milk in it. Hope this helps! Looks amazing! Was wondering if you could use homemade coconut milk as well? But that’s still not sugar free, just a different type of sugar. Maple syrup is not refined sugar. Yes that is true, but it is still sugar. Maybe you should specify “refined sugar free” instead.